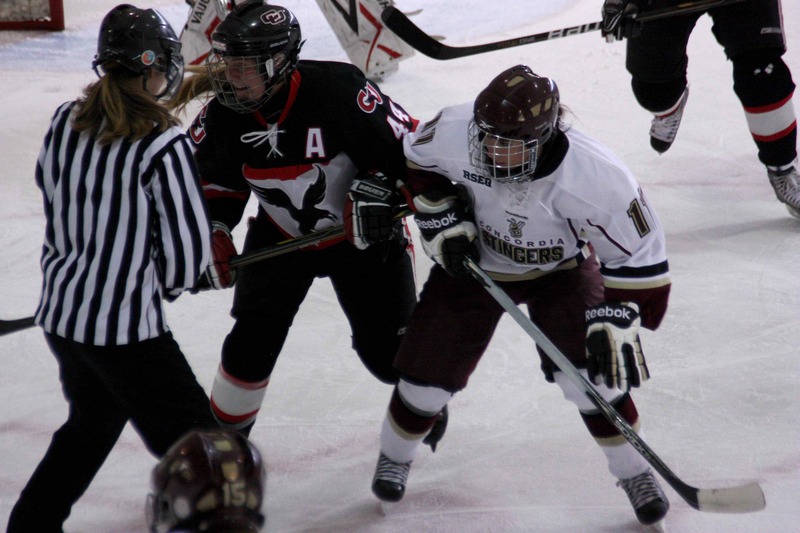 Stingers centre Alyssa Sherrard (11) and Carleton Ravens forward Sadie Wegner (44) face off. Photo by Alyssa Tremblay. The Concordia Stingers lost 3-1 in a tight game on Saturday afternoon against the Carleton Ravens at Ed Meagher Arena. The first period saw the Stingers go down after a controversial call by the referee. At 15:18, Ravens defenseman Kelsey Vander Veen shot at a scramble in front of the Stingers net. The puck did not seem to have crossed the line, and the goal light did not go on. However, the referee credited the goal to Vander Veen, which gave the Ravens the 1-0 lead. Just before the first period ended, Stingers defenseman Margaret Hotte was boarded and injured her ankle. She left the game with the help of a trainer and did not return. In the second period, Concordia pressured Ravens goalie Tamber Tisdale to try to tie the game. Left winger Veronique Laramee Paquette took a nice cross-pass from right winger Erin Lally with just under six minutes to go in the period, but she couldn’t find the back of the net. The Ravens doubled their lead when a weak wrist shot by forward Ainslee Kent from the side of the net managed to go past Carolanne Lavoi-Pilon at 7:12 of the second period. But with one minute left in the period, Laramee Paquette blasted a shot past Tisdale to cut the Ravens’ lead to 2-1. The third period was quiet, until 16:36, when defenseman Laurie Proulx-Duperre was sent to the penalty box for roughing. Frustration ensued for the Stingers and a short scuffle broke out. Just after play continued, the Stingers found themselves down two players when defenseman Mary-Jane Roper was sent to the box for four minutes for a hit to the head from behind, destroying the Stingers hopes to tie the game. At 19:17, the Ravens put the game away when Alexandra Yallouz scored into the empty net. Concordia travels to Ottawa to face the Gee-Gees on Saturday, Oct. 27 at 7 p.m. before returning home to play McGill at Ed Meagher Arena on Sunday at 3 p.m.